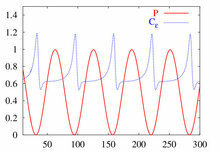 In a wide range of turbulent flows, the distribution of energy between scales is well-described by the Kolmogorov-Richardson cascade phenomenology. But when such an equibrium-cascade is perturbed, how does turbulence behave ? Is there any universality in non-equilibrium turbulence ?